Climate change is taking a toll on Texas, and the devastating floods across the state are some of the best evidence yet of that phenomenon, state climatologist John Nielsen-Gammon said. But efforts to consider climate change policy in Texas have fallen flat. Climate change is taking a toll on Texas, and the devastating floods that have killed at least 15 people and left 12 others missing across the state are some of the best evidence yet of that phenomenon, state climatologist John Nielsen-Gammon said in an interview Wednesday. "We have observed an increase of heavy rain events, at least in the South-Central United States, including Texas," said Nielsen-Gammon, who was appointed by former Gov. George W. Bush in 2000. "And it's consistent with what we would expect from climate change." But the state's Republican leaders are deeply skeptical of the scientific consensus that human activity is changing the climate, with top environmental regulators in Texas questioning whether the planet is warming at all. And attempts by Democratic lawmakers during the 2015 legislative session to discuss the issue have come up short. "In part, it's ideologically driven and intellectually lazy," said state Rep. Rafael Anchia, D-Dallas, who earlier this year invited national security experts to the state Capitol to testify at a hearing on the risks of climate change. “My question is: What are people scared of? Are they scared of the truth?" Asked about the role of climate change in the floods, U.S. Sen. Ted Cruz declined to weigh in Wednesday. 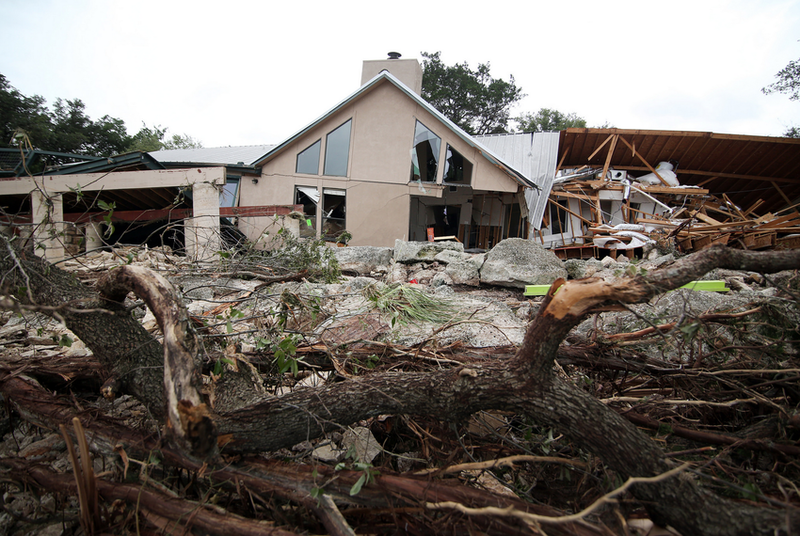 "At a time of tragedy, I think it's wrong to try to politicize a natural disaster," the Republican presidential candidate said during a news conference in San Marcos after surveying damage. Extreme weather events, and more of them, are among the most agreed-upon effects of global warming in all the scientific literature on the subject, said Nielsen-Gammon, who is also a professor at Texas A&M University. Part of the explanation is that ocean temperatures are rising, bringing more moist air into the state that can create storm systems. In the past century, precipitation in Texas is up 7 to 10 percent, and the frequency of two-day heavy rainfall spells has nearly doubled. The scientific consensus is much stronger on this point than on whether climate change can directly cause droughts. Nielsen-Gammon's own research has shown that warmer temperatures due to global warming did make the drought in Texas measurably worse than it otherwise would have been. But for the last several years, legislation calling for climate-change studies has not succeeded in the Capitol. Two bills that Anchia proposed on the subject — one that creates a global task force to study climate change and another directing Texas to follow new federal climate regulations — didn't make it out of the committee he chairs. Two other pieces of legislation that would have directed state agencies to consider climate forecasts never received a public hearing. The only climate-related bill that made it to the House floor would have required state agencies to include climate variability considerations in their strategic plans. The International Trade and Intergovernmental Affairs Committee voted unanimously in support of the bill, and no one testified against it — though a number of industry and conservative groups registered in opposition. When the bill reached the floor, it failed 84-47. There was no debate. “It didn’t even mention climate change. It was just about planning," Anchia said of the bill, which was authored by state Rep. Eric Johnson, D-Dallas. Among the no votes was Republican Jason Villalba of Dallas, who said Wednesday he didn't recall voting against the bill. Republican Todd Hunter of Corpus Christi also didn't remember his no vote. But he said that after this week's flooding, he's taking the need for planning for extreme weather seriously. "I'll certainly have it on my radar," Hunter said. "When you see these strange weather patterns, it's important to keep all of these things in mind." Leigh Thompson, a policy analyst at the conservative Texas Public Policy Foundation who opposed the bill, called it "far too speculative." Thompson said the state doesn't have the means to project climate and water conditions 20 to 50 years from now and "predict these effects on all those different organizations." But Nielsen-Gammon said there are definitely known impacts of global warming in Texas, and the state could be doing more with that knowledge. "We have the advantage of having non-zero information about how the climate's changing, and we're acting as though the information content is zero," he said. While there's no way to ever be sure exactly when, where or how much rain will fall, Nielsen-Gammon pointed out that California state agencies are all incorporating climate change into their long-range planning. "It certainly would be useful to know what we're getting into with climate change," he said. "Hopefully we can learn from California's experiences." Disclosure: Texas A&M University and the Texas Public Policy Foundation are corporate sponsors of The Texas Tribune. A complete list of Tribune donors and sponsors can be viewed here.